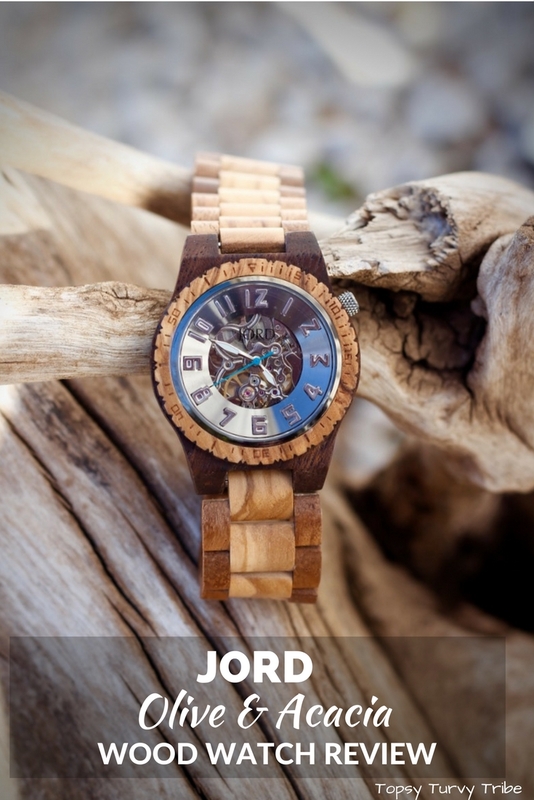 When JORD asked us to review one of the their unique handcrafted watches we said yes straight away as not only are they amazingly beautiful but they are made from natural wood! Delivery only took a week from the USA with UPS. After unwrapping the sturdy outer packaging you are struck by the quality of the Cedar wood presentation box, with a handy magnetic closure. The watch sits on a hessian pillow and below is a drawer for the included extras; spare links, a tube of natural finishing oil, polishing cloth, humidity control sachet and glass cloth. Each watch is individual because of the various colours and grains of the woods. Two types of woods are matched to complement each other. Using JORD’s easy to navigate website we chose a men’s watch from the Dover series, made from gorgeous Olive and Acacia woods. As we live in the middle of the Spanish campo surrounded by olive groves and use olive wood in our wood burning stove to keep warm every night, it seemed like the obvious choice. 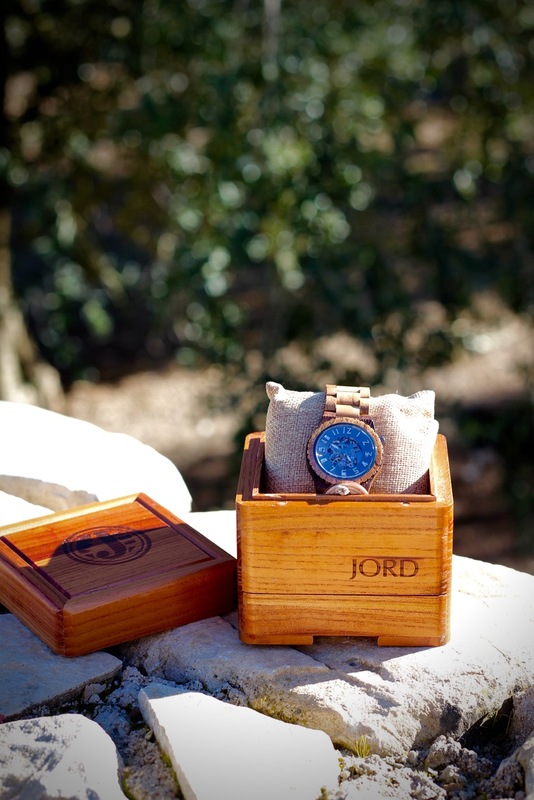 We love the fact that JORD watches are made from wood, not only do we adore the look of the warm wood grain but also love how more eco friendly our watch is than its plastic counterparts. It also ticks another eco box as you don’t need to bother with a battery; the watch is actually a self-winding automatic watch. This is not something we’d previously heard of, so had to look it up. Crazily enough it actually works and charges through movement. If you are wearing the watch, your everyday movements are enough that you will probably never need to wind it up. The mechanism is pretty stunning and with the Dover series watches, you can actually see the cogs and wheels through face and rear of the watch, it’s quite mesmerising to watch! The metal buckle easily opens with the click of a button, the watch comes made to measure and fits perfectly as you are asked when ordering your wrist size. JORD wood watches are contemporary, stylish, comfortable, a stunning piece of craftsmanship and a wonderful heirloom to pass onto our boys. 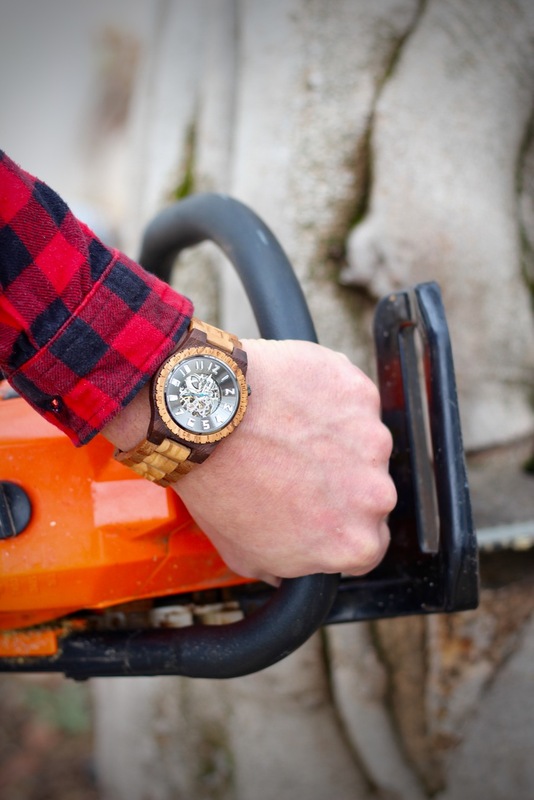 The wood watch is not only unique and gorgeous but also hard wearing and practical. A great choice for dressing up or for everyday wear. Thanks, good luck winning a voucher. Olive and accacia woods are apparently sustainable. Accacia can even be invasive. The watch looks really nice. They really are lovely, thanks for taking the time to comment. You are so lucky to get to review this watch! I looks fab! We are really lucky and it was a pleasure to review, thanks for commenting! Thank you for your lovely comment, They really are such beautiful watches! Thanks George, good luck with the competition! Hey, thanks for the review. Been seeing these Jord watches popping out all over the Internet. Now I hope it makes a good gift.